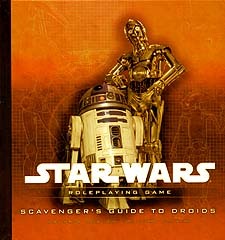 From astromechs to battle droids, the Scavenger's Guide to Droids features everything you need to bring the robotic inhabitants of the Star Wars saga to life in your own campaign. Featuring an in-depth look at droids from the perspective of a variety of droid experts, this book provides a wide array of new options for droid heroes as well as allies and antagonists. New droid creation and modification rules for heroic droids. An optional system for treating droids as equipment. Guidelines for how to include memorable droids in your campaign. New droid equipment, including dozens of accessories. Information on over 40 droid models, including some never-before-seen droids.